Origin and Habitat: Strumaria bidentata is endemic to the Northern Cape (Richtersveld, lower Gariep Valley inland of Alexander Bay), as well as southern Namibia. Habitat and Ecology: Western Gariep Lowland Desert, Western Gariep Plains Desert. This species grows in gravel plains and sandy flats near the river bank of the lower Orange River and close to its mouth, together with Eriospermum namaquanum, Cheiridopsis verrucosa and Sarcocaulon multifidum. This species is threatened by severe, ongoing habitat loss and degradation due to mining and overgrazing. It has also lost some habitat to irrigated crop cultivation on the banks of the Orange River in the past. This species' range within South Africa is entirely within one large communally owned rangeland, and the whole population is subjected to severe overgrazing and trampling, particularly as a result of a significant increase in stocking rates over the past 10 years, and rapid, severe population declines have been observed.This species is localized to a small area, where it occurs in small, scattered subpopulations of only a few individuals, typically fewer than 10 plants. Due to extremely limited dispersal ability of Strumaria species, it is unlikely that there is significant dispersal between the South African and Namibian population. Description: Strumaria bidentata is a rare plant, an autumn flowering geophyte which has sticky leaves that collect grains of wind-blown sand. This sand-bearing habit, known as psammophory, is characteristic of many plants from different families that thrive in sandy, windswept places. The delicate white flowers with maroon stamens are held on a stalk up to 12 cm tall that emerges out of the desert sands before the leaves emerge. Strumaria bidentata is one of 24 species in a less known genus of the Amaryllidaceae family. Bulb: Subglobose, with white tunics. Leaves: Mostly 2, in winter after the autumn flower has disappeared, they are erect from the ground, rounded or tongue-shaped with red margins. Inflorescence: Scape 7-12 cm long with 10-12 flowers in a dense umbel up to 3 cm across. Spathe-valves 2, purple, lanceolate-cuspidate. Pedicels slender, erect. Flowers. Ascending, white, contrasting well with the reddish maroon anthers. Tepals less than 8 mm long white, tinged with red outside at the base; segments lanceolate. Filaments shortly connate, bidentate and dilated at the base. Style broad in lower half, abruptly narrowed into a slender column above. Strumaria flowers drop off when withered, unlike those of Hessea species, another genus of the family with similar flowers, but the most interesting fact is that after the flower is pollinated the inflorescence bends over to the side and dispels the seeds after reaching maturity. This is very strange as other amaryllis family bulbs actually detach and loose the whole fruiting head and the tumbleweed structure rolls free over the landscape thus expelling the seeds. The fruiting head on Strumaria bidentata stays on the plant. 2) Hilton-Taylor, C. 1996. "Red data list of southern African plants". Strelitzia 4. South African National Botanical Institute, Pretoria. 3) Hilton-Taylor, C. Unpublished. "Succulent Karoo Red Data List (version 1997 - in preparation)". SANBI. 4) Muller-Doblies, D. and Muller-Doblies, U. 1985. "De Liliifloris notulae 2: De taxonomia subtribus Strumariinae (Amaryllidaceae)". Botanische Jahrbucher fur Systematik 107:17-47. 5) Raimondo, D., von Staden, L., Foden, W., Victor, J.E., Helme, N.A., Turner, R.C., Kamundi, D.A. and Manyama, P.A. 2009. "Red List of South African Plants". Strelitzia 25. South African National Biodiversity Institute, Pretoria. 6) Snijman, D.A. 1992. 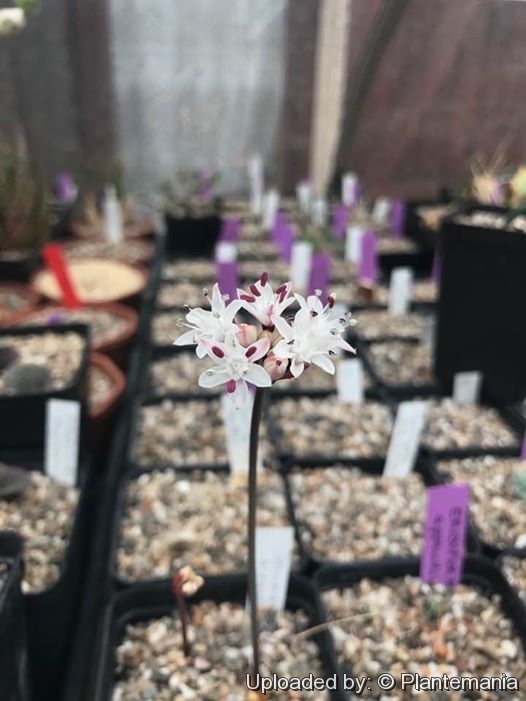 "Notes on the Strumariinae (Amaryllidaceae : Amaryllideae): six new taxa in Strumaria and Hessea from the central and northwestern Cape, South Africa, and southern Namibia". Bothalia 22(1):1-11. 7) Snijman, D.A. 1994. "Systematics of Hessea, Strumaria and Carpolyza (Amaryllideae: Amaryllidaceae)". Contributions from the Bolus Herbarium 16:1-162. 9) Victor, J.E. 2002. South Africa. In: J.S. Golding (ed), "Southern African plant Red Data Lists". Southern African Botanical Diversity Network Report 14 (pp. 93-120), SABONET, Pretoria. 14) Duncan, G. 2000. " Grow bulbs". Kirstenbosch Gardening Series. National Botanical Institute, Cape Town. 15) Du Plessis, N.M. & Duncan, G.D. 1989. "Bulbous plants of southern Africa". Tafelberg, Cape Town. 16) Manning, J., Goldblatt, P. & Snijman, D. 2002. "The color encyclopedia of Cape bulbs". Timber Press, Oregon and Cambridge. 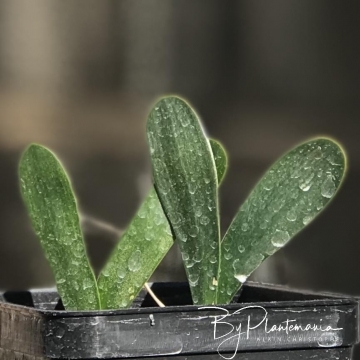 Cultivation and Propagation: Strumaria bidentata is highly suited to pot culture. It should NOT be treated as a bedding plant as it depend on excellent drainage to survive. In cultivation it flowers well and produce abundant seed. When grown from seed, flowers can be expected from its third season onwards.